It’s easy to feel overwhelmed by all the different types of car seats. Choosing the best one for your baby, budget and vehicle is a complicated business, but it’s also necessary as a suitable, properly fitted car seat is the safest way for a baby, toddler or child to travel in a car. According to government guidelines, all children must normally use a child car seat until they are 12 years old or 135cm tall, whichever comes first. The guidelines also state that you should buy a car seat based on your child’s age, height or weight. The Royal Society for the Prevention of Accidents agrees, adding: "You cannot be certain of its history. It may have been involved in an accident and the damage may not be visible." Second-hand seats may not be designed to current safety standards, either, and it may not fit your car. Now that you know the importance of buying new, how soon do you need to buy a car seat? Before baby has arrived – no hospital will let you drive your newborn home if you don’t have a suitable car seat fitted. Any car seat sold in the UK must be EU approved and carry the ECE R44.04 approval mark. This ensures the seat has undergone rigorous safety testing, including frontal and rear collision testing. It’s also worth noting that i-Size is the new European standard for child car seats. i-Size regulations provide children with additional protection and safety in the car, and while the existing EU R44.04 legislation stands for now, iSize will eventually become the only standard. It’s the law for all babies to start off in these rear-facing car seats, and to stay in them until they weigh at least 9kg. Why? Because facing backwards helps prevent injuries in a crash – a rear-facing seat pulls the child into it, limiting the movement of their head on their neck and supporting their spine. It's also illegal to use a rear-facing car seat in the passenger seat if there's an active airbag. Before you begin browsing online retailers or visiting your local car seat seller, work out your budget. That way you can stay in financial control and buy the best car seat for baby without breaking your bank. There are dozens of stellar seats falling within the £100-£150 price range. The Baby Jogger City Go is a good example of an affordable car seat for babies aged 0-15 months, while the Maxi-Cosi Pebble Plus O+ is a reasonable buy on both sides of the atlantic. 2. What ‘group’ of car seat do you need? Car seats are split into different groups, from 0 to 3, with each group representing a different stage (weight, height, age) in your child’s growth. Some seats, such as the Joie Every Stage 0+/1/2/3 or Graco Milestone All-In-One Car Seat 0+/1/2/3, will see your child through from birth to when they no longer legally require a car seat. Group 0 is for newborns, but these lie-flat car seats have largely been replaced by group 0+ models for babies aged 0-15 months or weighing up to 13kg. Some of the most recent group 0 and 0+ car seats may also be i-Size, a seat type based on baby’s age and height, rather than their age and weight. Once baby reaches 9kg you can move them into a forward-facing child car seat, but many official bodies recommend leaving babies in rear-facing car seats until they are 13kg to further ensure their safety. Once baby is ready to move into a forward-facing seat, look at group 1 (9-18kg) and group 2 (15-25kg) car seats. There are also combination seats that cross over both groups, sometimes incorporating group 3 (15-36kg, or children aged 3 to 12). 3. Are there ample safety and comfort features? Does it offer side-impact protection? This is an important consideration for any car seat, but especially if you will be regularly undertaking long car journeys with your baby or child. The main features to look out for include padding on the straps, plus infant head and body support cushions to provide lasting comfort and aid proper positioning. An upfront harness adjustment allows for easy access when positioning and clipping baby into their seat, with a five-point harness offering the safest fit at the shoulders, hips and between the legs. The car seat also needs side impact protection to shield baby’s body and head, reducing the force of an impact. The Joie Stages 0+/1/2 (UK) uses a five-point safety harness, as does the Chicco Nextfit Zip (US customers). 4. What space do you have for a car seat? If you plan on having more than one car seat in the back of your car, keep the width of each car seat in mind – and pay attention to how much room you or another grown-up passenger will have to get past the child car seats, positioned behind the driver and passenger seats, and into the middle seat. To ensure your preferred car seat fits your car, measure your car’s seat space and check the position of the seatbelt buckles. Next, compare those to the child car seat dimensions to figure out if it’s a likely fit. If you’re buying from a store, call ahead and ask if there’s a car seat fitting expert who can help you. Some online retailers also offer a live customer chat service if you need guidance. 5. Does the seat use special fittings or systems? Different car seats use different safety systems and fittings. Isofix (International Standards Organisation Fix) is an increasingly popular safety system that decreases the risk of wrongly-fitted car seats. 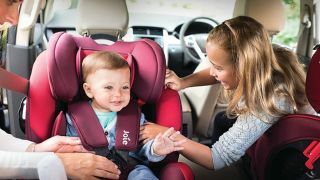 With Isofix, the car seat is fitted into the car itself via a special base (which may be sold with the seat or separately, depending on the model) rather than via a seatbelt alone. A top tether or support leg is used to prevent the seat rotating during impact. There are three types of Isofix: Vehicle Specific Approval (compatible with specific vehicles, using a two-point connection system), Semi-Universal Approval (compatible with specific vehicles; can be rear-facing or forward-facing) and Universal Approval (for forward-facing group 1 seats, using a two-point connection system and a top tether). i-Size car seats also fit in cars with Isofix fitting points. These fitting points are built into both cars and child car seats. To discover whether your car has Isofix points, look for Isofix labels between your car’s seats or check your vehicle handbook. Looking for Isofix-compatible car seat inspiration? Try the Britax Romer DUALFIX, a stunning car seat for babies and children aged 0-4 years. 6. Is the car seat convenient for everyone to use? There’s little point in buying a car seat that only you know how to use. What happens when your partner needs to use the car seat and you’re not around to help? Or if your parents or friends have agreed to babysit your little one and need to use the car seat but don’t know where to start? Bottom line: keep in mind ease of use for anyone likely to regularly use the seat when minding baby. On a similar note, can the car seat be easily transferred from one car to another? If your baby is likely to travel in another car regularly, check to see if the car seat also fits in their vehicle. Lastly, check to see if the manufacturer has an online installation guide that your family or friends can view if needed. 7. Is there a money-back guarantee? If you’re ordering online, choose a car seat from retailers offering a money-back guarantee. 30-days is average, but some offer 14 days and some a lot longer. The point of this guarantee period is for you to see if the car seat you’ve bought definitely fits in your car. If it doesn’t, repackage it in its original materials and return it. However, check the retailer’s returns policy before buying as some will not accept returns once the product has been opened. 8. Does it come with washable covers? Or at the very least, does it have wipe-clean features? Babies and toddlers are messy – and older children can be messier still! Car seats therefore get dirty quickly, so washable or wipe clean covers are a good idea. Whilst we’re on the subject of messiness, keep the colour of your car seat in mind – lighter colours will show up stains far quicker than darks. The Graco 4ever All-in-One Convertible Car Seat (US) has a washable seat cover, and the stylish Cybex Sirona M2 i-Size (UK) can be wiped clean of sticky prints, should your child decide to share their fruit cup with the car seat.